We are called golf road warriors and today was the second time on this trip that the old warrior spirit needed to come to the fore. 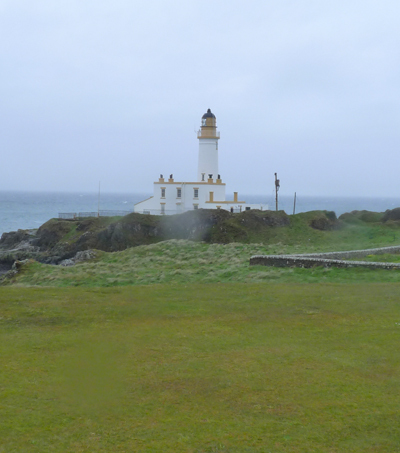 The rain and wind on day one at Dunaverty Golf Club was a light breeze and drizzle compared to today’s deluge in winds of over 30 mph. Let me give you a prospective, I have never had acupuncture needles arrowing at my face, but after today I can certainly tell you what that sensation would feel like! The Kintyre Express ferry from Campbeltown to Ballycastle was cancelled due to the weather, so it was a five-hour road trip for the warriors, but undeterred David DeSmith and myself hit the links in our now well tested Sun Mountain rain suits. Even in this weather Turnberry was everything I had imagined and more, I have always wanted to play this course, the memories of Tom Watson nearly winning his 6th Open Championship, I am sure Tom is looking forward to this years Seniors Open Championship being help here this summer. From the iconic lighthouse, memories of the Duel In The Sun, to that drive down the 18th, Turnberry just oozes class and history. The views out to the sea, even in this storm where wondrous and a pleasure to behold, yes you really do walk in the footsteps of legends, when you tee it up here.